Unlike the original, the second-gen Compute Stick is something you'd actually want to use. 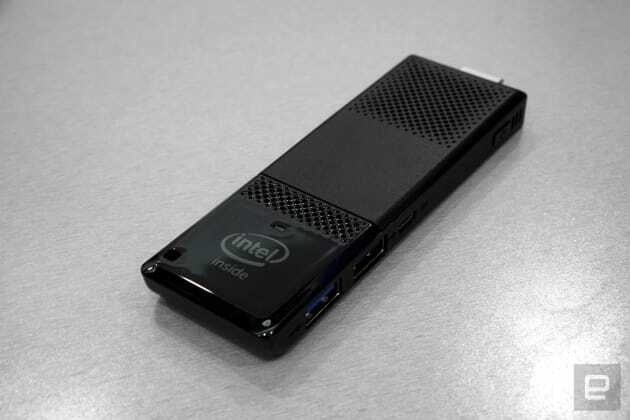 I had high hopes for Intel's original Compute Stick, but it ended up being a massive disappointment. Sure, it was cool to have a fully functional computer the size of a few thumb drives. But it was awfully slow and limited in some truly baffling ways (only one USB port?!). 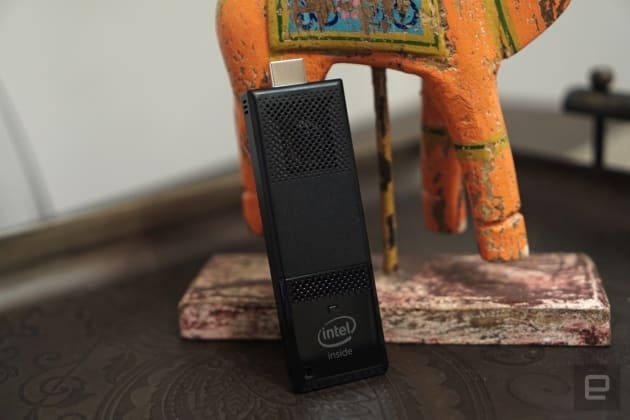 Now with Intel's second-gen Compute Stick ($159), it's another story entirely. It may look similar, but it packs in enough upgrades -- a faster processor, better networking and more USB ports -- to actually make it a usable computer. How would you rate the Compute Stick (2016)? The first Compute Stick felt like a prototype that left Intel's labs before designers ever laid their eyes on it. This new model, on the other hand, looks and feels like a solid piece of consumer kit. Instead of a boring rectangular design, it has smooth curves and perforated openings for its tiny fans (previously they looked like cheap fan grilles molded into plastic). Even though it's a device that'll mostly live behind monitors, it's also meant to be portable, so being attractive is a plus, as you're bound to show it off. It feels more solid in your hand, thanks to a tasteful balance of matte and glossy plastic. Heck, even the placement of the Intel Inside logo seems better (it's now lower on the device instead of in the middle and has less garish coloring). 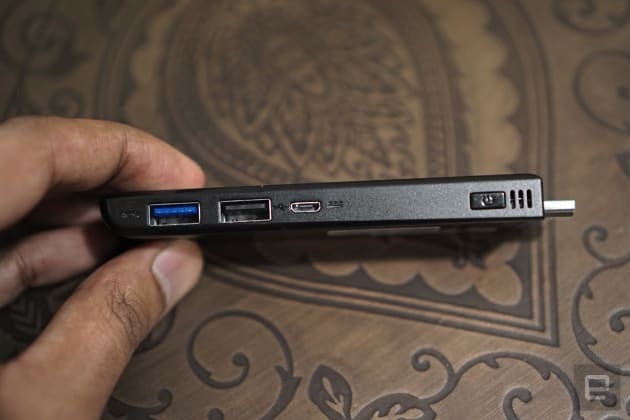 Intel has also included two USB ports this time around (one of them USB 3.0), so that you can connect a keyboard and mouse without resorting to a hub. (If you were one of the readers who thought I was being unfair by complaining about the first model's single USB port, this is why. It's not as if Intel couldn't fit in another port the first time around, and a USB hub kind of defeats the purpose of such a compact device!) I tested the Compute Stick with a wireless keyboard and mouse, so I only needed to use one of the USB ports for a wireless dongle. But the extra port came in handy for transferring files and updating the BIOS without removing my input devices. 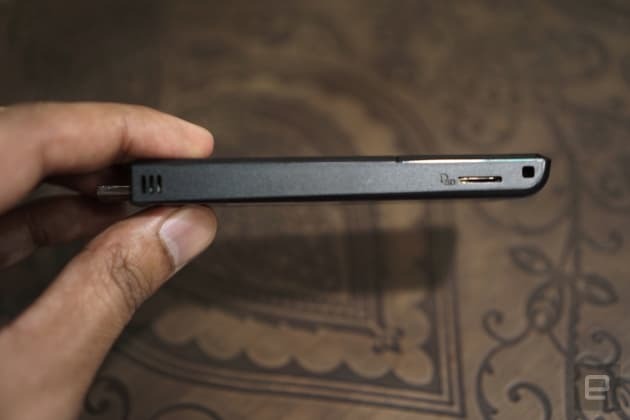 Once again, the Compute Stick features a microSD slot for an additional 128GB of storage (on top of the 32GB of internal storage). 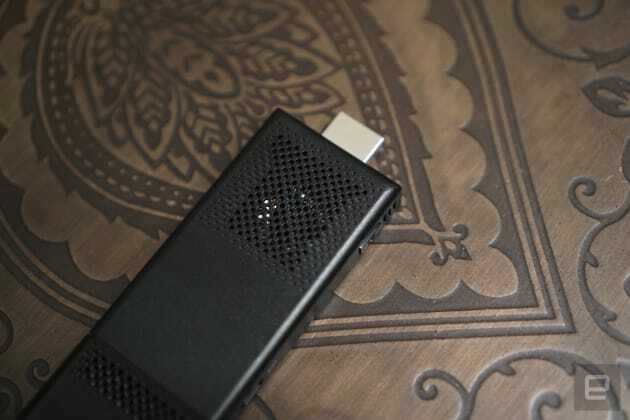 There's also a micro-USB port for the power adapter. You still need to plug it into an AC adapter, unfortunately, which makes it a tad less portable than it may appear at first. An Intel spokesperson said the company is looking into the SuperMHL standard, which could power future models entirely over HDMI. A small power button lives on the side of the Compute Stick, and this time around there's a small cap to protect the HDMI connector. That should make it less dangerous to chuck it in your bag or pocket. 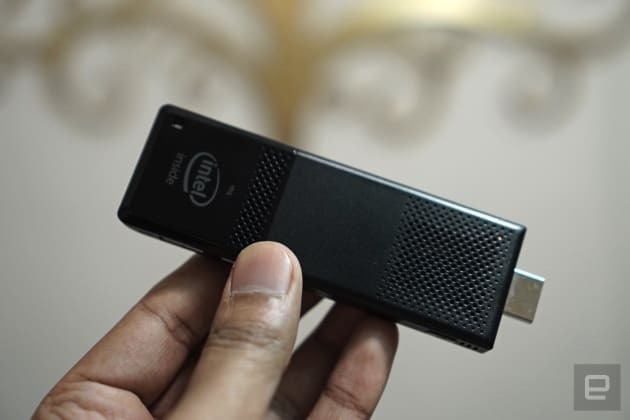 If your HDMI ports are too crowded on your TV or monitor, Intel has also packed in a small HDMI extension cord to give the Compute Stick a bit of breathing room. Installing the Compute Stick was a cinch: I plugged it into my TV, connected the power adapter and plugged in the wireless dongle for my keyboard and mouse. It booted up immediately, and it took about four minutes for me to run through the initial Windows 10 setup process. After a reboot, it took another five minutes to plug in my Windows login details and wait for my user account to bake. That may seem a tad lengthy, but it's on par with what I've seen while setting up other Atom-based computers. Once I hit the desktop, I immediately opened up Microsoft Edge and then YouTube to test the Compute Stick's media capabilities. It loaded 1080p streams far faster than the previous model, though there was a bit of slowdown as I swapped between full-screen and windowed views. But, feeling a bit cheeky, I also played some 4K streams and was surprised to see the Compute Stick managing them just fine. Occasionally it would get stuck on a frame and then catch itself back up, but the fact that it was able to load and play 4K without any buffering or major slowdown is still notable. Of course, the Compute Stick's 1.44GHz Atom x5-z8300 processor was pretty much maxed out while playing 4K, but that's not terribly surprising. After suffering through slow download speeds with the original Compute Stick, I was surprised to see that the new model doesn't have any issue bringing down large 4K files. That's mainly due to improved networking hardware: a 2x2 antenna array and 802.11ac WiFi support. The first Compute Stick only had a single WiFi antenna, which limited its overall speed and also made it tough to both download and upload data at the same time. Emboldened by its YouTube performance, I started using the Compute Stick as I would a typical computer. I loaded several browsers with multiple tabs; opened multiple programs in the background, including Spotify and Slack; and proceeded to go about my usual workflow. And, surprisingly, the experience wasn't half bad. The Compute Stick slowed down a bit as I quickly alt-tabbed between programs or streamed Spotify music while downloading large files; but while the first model felt too slow for comfort, this one simply feels comfortable. It wasn't long before I felt the limits of its limited 2GB of RAM, though. While that used to be all you needed for a decent computing experience, these days browsers and most web pages eat up memory quickly. Hopefully next year Intel will be able to include 4GB of RAM in its base Compute Stick (this year's upcoming faster models all include 4GB of RAM). As the benchmarks show, this Compute Stick is significantly faster when it comes to 3D. And while its PCMark 7 score is only marginally faster, I wouldn't worry too much about that. Real-world performance matters a lot more to me than benchmark numbers, and doing just about everything on the Compute Stick felt significantly faster than it did with last year's version. The new model even managed to play some simple games, like Hotline Miami 2 and Undertale, which the original version couldn't even touch. One potential issue for some: The Compute Stick's tiny fan made itself known while I was running benchmarks, even though it was about 12 feet away from me in my living room. Thankfully, I didn't hear it much during normal usage. But it's not the sort of device I'd leave running high-load tasks (or at least, as much as you can make the Atom x5 do) in my bedroom overnight. Mostly I'm impressed by just how versatile the new Compute Stick happens to be. It's more than powerful enough for kiosks and computer labs, but it can also be a solid cheap home theater computer. I was able to access network shares on my desktop and play back HD video files without any issue. This year, Intel isn't going to offer a cheaper model of the Compute Stick (last year, there was a Linux-focused model for $110 with a 8GB of storage and 1GB of RAM), but that seems like a wise choice. Instead, the company is going a bit higher end. Upcoming Compute Stick models will include Core M3 and Core M5 processors for $399 and $499, respectively. They also pack in 4GB of RAM, which means we should expect performance along the lines of slower Ultrabooks, and three USB ports (two on the power adapter). Intel says both models can spit out 4K video at 30Hz, and the Core M5 version (which doesn't come with an OS) also includes its vPro hardware-level security technology. Of course, they don't offer the same amount of value as the cheaper $159 model, but I'm still intrigued to see how much power Intel can stuff into this tiny case. You can bet we'll put them through their paces when they're available. Well, Intel did it. The Compute Stick bundles just about everything you'd need for a basic computer into a compact, inexpensive package, and unlike its predecessor, it works. It's no wonder we named it one of our Best of CES finalists this year. If you have a spare monitor laying around, you could easily turn that into a machine for your kids or some sort of household kiosk. And no matter how you use it, it'll make you rethink your notion of what a PC can be.